Heather Logue is a Lecturer in Philosophy at the University of Leeds. Her research focuses on issues in metaphysics and epistemology, and particularly on issues concerning perceptual experience. She has published and forthcoming papers on Naïve Realism, disjunctivism, skepticism about the external world, and the metaphysics of color; and she co-edited (with Alex Byrne) Disjunctivism: Contemporary Readings (MIT Press, 2009). 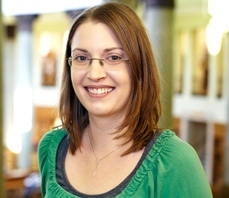 Before coming to Leeds, Heather completed her PhD at MIT in 2009 and her bachelor’s degree at the University of Pittsburgh in 2003. In “The Matrix”, humans are used as batteries by their robot overlords. They are blissfully unaware of their subjugation thanks to the Matrix—a machine that stimulates their brains so that they’re having perceptual experiences that they couldn’t tell apart from ordinary ones. By ‘ordinary experiences’, I mean ones generated through normal interactions with the world beyond the Matrix. And by ‘Matrix experiences’, I mean the ones that philosophers call total hallucinations—experiences that merely seem to be of the world, when in actual fact you’re not perceiving anything in you’re environment at all. It seems to the people plugged into the Matrix that they are taking walks through parks, enjoying delicious ice cream, stubbing their toes on bedposts (and so on), when all the while they are just stuck in vats of goo. This imagined scenario is troubling: if the characters in the movie can’t tell whether they’re in the Matrix, how can we? On the face of it, what it would be like to be in the Matrix is exactly the same as what’s it’s like to interact with the ordinary world. Hence, we can’t tell our experiences apart from Matrix ones, and we can’t know that we’re not in the Matrix. I think that this is a genuine worry only given two assumptions (which, it must be said, are held by most philosophers). In the rest of this post, I will explain the assumptions, how one can reject them, and how rejecting them could give us knowledge that we’re not in the Matrix. The first assumption is that what it’s like to have an experience (its phenomenal character) is entirely “in our heads”. As I think of it, the phenomenal character of an experience is (roughly) its “feel”—it feels different to experience red than it does to be tickled, or to experience green. This assumption says that the feel of an experience is entirely down to what’s going on inside our heads (presumably, our brains). The second assumption is that we can have knowledge of our experiences in the Matrix. The idea is that all we have to do to know things about our experiences is to (in some sense) look within. By looking within, I can at least be certain that I’m having an experience of a yellow thing, and that my experience has the feel associated with experiences of yellow things. Even the poor humans stuck in the Matrix can do this—they can look within, even if they can’t look without. So even though they can’t know anything about what’s going on around them, they can at least have knowledge about their experiences. Contrary to conventional philosophical wisdom, I think we should reject these two assumptions. And if we do, we have a way of knowing that we’re not in the Matrix. As for the first assumption, I think we should reject the claim that phenomenal character is entirely in our heads, and hold that it includes things outside it. In particular, we should say that what it is like to have an experience consists in perceiving things in one’s environment. (This kind of claim is a version of what’s commonly known as ‘Naïve Realism’, or the ‘Relational View’ of perceptual experience.) For example, on this view, what it is like to experience yellowness consists in perceiving an instance of yellowness. It would take me too far afield to explain why I am attracted this view here (but if you’re interested, you can check out my paper “Why Naïve Realism”). For present purposes, the pressing issue is why most philosophers don’t hold it. Most would balk at what it entails about total hallucinations. Since total hallucinations don’t involve perceiving things in one’s environment, this view entails that there’s nothing it’s like to have them. Surely that’s absurd! Someone having a total hallucination can’t tell it apart from an ordinary experience. Surely that entails that what it’s like to have them must be exactly the same, and so that there must be something it’s like to have a total hallucination (since there is something it’s like to have an ordinary experience). Or does it? This is where the rejection of the second assumption comes in—that we can have knowledge about our experiences in the Matrix. Let’s think more carefully about how we get knowledge of our experiences. Do we really learn about them by looking within? It seems to me that we actually learn about them by looking without—by attending to the things in our environments that we perceive. (This model of how we acquire knowledge about our experiences is inspired by the one outlined in Evans 1982: 227-8.) For example, if you ask me what I’m experiencing right now, I don’t know what to do in order to answer your question other than to look out to what’s going on in my environment, and report back: I’m experiencing something yellow. Notice that this way of getting knowledge about our experiences couldn’t work properly in the Matrix. The subjects of Matrix experiences don’t perceive anything in their environments. So when they try to attend to what’s going on in their environments, it turns out that they can’t. Given that they can’t do what they’re supposed to do to get knowledge of their experiences, it wouldn’t be surprising if they ended up with a bunch of false beliefs about them. One such false belief could be that there’s something it’s like to have their Matrix experiences. That is, they would form the belief that there’s something it’s like for them to have their experiences, even though this belief is false—because their way of getting knowledge about their experiences can’t work properly in the Matrix. Finally, if we deny the first assumption, we can know that we’re not in the Matrix. We can know we’re having ordinary experiences rather than total hallucinations by knowing that there’s something it’s like to have them. After all, on my view, only ordinary experiences have a feel to them. So we can know that we’re not having Matrix experiences by knowing that we’re having experiences that have a feel. I realise that this isn’t going to initially strike most readers as satisfying. For given that we would falsely believe that there is something it’s like to have our experiences if we were in the Matrix, how can we rule out the possibility that the experiences we’re having right now are Matrix experiences? It seems to me that this question expresses a demand for the impossible: a way to “step outside” our experiences in order to compare them with the external world, in order to check whether they “match”. But, much as we might like to, limited creatures like us cannot take an experience-independent perspective on the external world. As far as I can see, that’s the only way we could go about ensuring that we wouldn’t believe that we weren’t in the Matrix if we in fact were. But since it simply isn’t available to us, I think we ought to reject the idea that knowing that p requires that one wouldn’t believe that p if it were false (i.e., that sensitivity is a necessary condition for knowledge). This broad kind of strategy isn’t novel (see, e.g., Sosa 2000, Williamson 2000, and Pritchard 2012, among others). But I have found previous implementations of it unsatisfying. They are short on detail when it comes to the following question: what exactly is it about perceptual experience that puts us in a position to know that we’re not in the Matrix? I have suggested that its phenomenal character plays this epistemological role. Sure, we would falsely believe that our experiences had phenomenal character in cases of total hallucination. But (as even Descartes conceded in Meditation I) the fact that a mode of epistemic access yields false beliefs in conditions unfavourable for its employment does not impugn its capacity to yield knowledge in favourable conditions. So the fact that total hallucination is a defective context for getting knowledge about experiences (as I suggested above) doesn’t mean that it cannot afford knowledge that our experiences have phenomenal character—and thereby, the knowledge that we’re not in the Matrix—in ordinary circumstances. Logue, H. 2012a. What should the Naive Realist say about total hallucinations? Philosophical Perspectives 26: 173-99. Logue, H. 2012b. Why Naive Realism? Proceedings of the Aristotelian Society 112: 211-37. Pritchard, D. 2012. Epistemological Disjunctivism. Oxford: Oxford University Press. Sosa, E. 1999. How to defeat opposition to Moore. Philosophical Perspectives 13: 141-54. Williamson, T. 2000. Knowledge and Its Limits. Oxford: Oxford University Press. Interesting post, but I don’t follow one of the central moves. You write: “The subjects of Matrix experiences don’t perceive anything in their environments.” This seems plainly false. Subjects in the Matrix have an environment: it’s just that it’s a computer-generated environment. And I don’t think you can say we know we don’t live in a computer generated environment–for there are a number of people (myself included!) who have argued that ther “environment” around us is probably computer generated (I’ve argued that it may be necessary for explaining quantum mechanics). Anyway, your argument from naive realism presupposes that our “environment” (i.e. red stop signs, cars, etc.) isn’t computer generated. But you can’t get that assumption out of naive realism. You have to stipulate it–which begs the question, no? Hi Marcus– I think we might mean something different by ‘environment’– the environment of Matrix subjects contains the computer overlords, not what the computer overlords generate. Matrix subjects don’t perceive anything in the environment containing the computer overlords. As for whether our environment has to be computer generated in order to explain quantum mechanics, I’m afraid I don’t know enough about that to weigh in one way or the other! But all I’m suggesting is that we can know that our environment isn’t generated by evil demons, machines, and the like. I do not think you’ve done this (“But all I’m suggesting is that we can know that our environment isn’t generated by evil demons, machines, and the like”). “Someone having a total hallucination can’t tell it apart from an ordinary experience. Surely that entails that what it’s like to have them must be exactly the same, and so that there must be something it’s like to have a total hallucination (since there is something it’s like to have an ordinary experience). I wonder if the issue here is semantics and education related, to both the premise of the movie itself and physical brain architecture and chemistry. People who are in the matrix aren’t CREATING the matrix, they are observing what is happening in their environment–which is the program called the matrix. It’s forced upon them. The matrix, as I understand it from the movie, is software in which human minds are trapped in much the same way their bodies are trapped by the hardware of the physical matrix battery environment. They see exactly what they are expected to see–namely the mental environment created by and provided by the machine overlords, the matrix, rather than the physcial environment their bodies are in–because there is a disconnect between what their minds can perceive (mental environment) and what their bodies are actually doing (physical environment). This is done ostensibly by preventing the brain from perceiving what’s physcially happening to the people, and instead making their brains feel like they are living physical lives in environment presented to them rather than the mental ones they actually are living. You make the assumption that YOU are directly perceiving things. But YOU are not. What YOU are perceiving is the interpretation of what’s happening to you physically. Let’s first define “you.” What constitutes “YOU”? If someone was to cut off your hand, would you still be you? Yes. Now, you might change over time mentally due to depression over the loss, or due to a renewed love for life, etc. But what your mind tells you is YOU would be unchanged, though your BODY might be changed. Our minds definitely make that distinction. And if you take that argument to the logical and valid end, there is nothing physical that makes us “us” other than the thing we cannot change without changing who we are: our brain. Look into any neuroscience sub-field and this is what you will learn. So the thing that is “YOU,” namely your brain, does not directly perceive things but uses intermediaries: eyes, ears, skin, tongue, etc. So what YOU are actually perceiving is a non-direct interpretation of what is going on around our physcial bodies–an interpretation that can be hijacked. (Let’s also not forget that it’s far from complete, since we do not perceive many of the wavelengths of light boucing around us all the time, for example.) All you have to do is disrupt the lines of communication from our direct sensors (eyes, ears, the cellular receptors for light, sound, pressure, etc) to our processing station (brain) and you can make the processing station perceive whatever you want to make it perceive. Your second assumption, that we can only have knowledge of our experiences by “looking within” (do you mean thinking? ), is not actually an assumption, it is a verifiable fact. I don’t know how we perceive anything without “looking within” as “looking within” is just another way of saying perceiving something. You never perceive something visually by directly seeing it (how would that work I wonder), you perceive something visually by interpreting the signals the receptors in your eyes send to your brain, and your brain makes a subjective picture of it. And that’s “looking within.” The idea that there is a way to “look without” is a fallacy born of a lack of understanding about how the brain works. All experience is subjective, and it’s all subject to how our brains interpret what information it gets sent by the body it controls. Of course, on top of that we layer our emotional beliefs about the event, which can very much change our perception of what’s happened physically. The problem here is that you believe that there is a way to look without, and there isn’t. There is ONLY looking within. Perhaps you need a bit more neuroscience? In addition to this problem, your paper exceprt above feels very circular to me. You go back and forth between one point and the next, and at one moment seem to use the first to support the second, and at others use the second to support the first. But where’s the actual support? If they hang on each other but neither is accurate, they have nothing to support them and they are invalid. It seems like this point could be made very easily if it were valid, but it requires a lot of dancing around because it’s not. It seems to me that you make a suggestion that forms a crux of your argument without supporting it! How is total hallucination a defective context for getting knowledge if by total hallucination you are refering to the software that makes the brains of the people in the matrix believe that they are not in a vat of goo but living some other life in some other place? In this case, total hallucination would be unable to be determined as being different from reality, because it’s all encompassing. Perhaps I’ve missed soemthing in your statements that perceiving a thing in a hallucination requires some reality outside a person to verify it against…..
And anyway, you should look into the maths accosiated with the idea that we are in the matrix (or a computer simulation, I’m basically arguing either since we couldn’t tell the difference between them)–it’s fairly compelling. Hard science includes data, which can be verified much more easily that beliefs or suggestions. I mean, I grew up christian, so I know about belief and how it can be totally disconnected from “reality.” Just because an idea sounds neat doesn’t mean it holds water. It might just be a pretty but non-functional dance, which brings it into mental masturbation area. I feel like that’s what this paper is.